Dr. Jorge Ramirez-Vallejo is a well established scholar in applied economics at the Harvard Business School and the Universidad de los Andes in Colombia. For nearly a decade, he has played a primary role in helping an international network of universities to enhance and expand their business school curriculums with the inclusion of “microeconomics of competitiveness” (MOC) courses. Dr. Ramirez-Vallejo earned his master’s and Ph.D. in applied economics from the University of Minnesota in 1987 and 1990, respectively. Before embracing his current career in academia, he served as an adviser on competiveness to the executive branch of the Colombian government as well as other countries, including Mongolia, Peru, Mexico, Botswana, and Argentina. He also served as an economic competitiveness consultant for the World Bank; the Inter-American Development Bank; the United Nations; and CAF, the development bank of Latin America. Dr. Ramirez-Vallejo joined the Harvard Business School in 2008, playing a significant role in introducing the MOC course as a key offering for the curriculum. Through his extensive network of more than 100 universities (including the Humphrey School at the University of Minnesota), Mr. Ramirez-Vallejo has helped faculty members from various countries effectively teach MOC at their institutions. Outside of the Harvard Business School, Dr. Ramirez-Vallejo has worked on various competitiveness research projects in a range of countries. In his home country of Colombia, he launched the Center for Competitiveness at the Universidad de los Andes, and led multiple projects on economic development largely focused on how locations and countries can organize themselves for upgrading competitiveness. 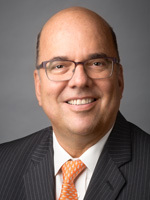 In naming Jorge Ramirez-Vallejo as a recipient of the Distinguished Leadership Award for Internationals, the selection committee acknowledges his entrepreneurial skill, academic integrity, and ability to affect the world in a positive manner. He has broadened the business school curriculum with the inclusion of MOC courses at universities around the world, including his alma mater.